Notes: Home of Friendless holds its first Annual Meeting. Notes: The object of this Association is to provide a “Home” for friendless or destitute girls, either orphans, half-orphans, or abandoned by their parents, where they may be received and provided for, until permanent homes in Christian families can be secured for them, by adoption or otherwise. See: Constitution and By-Laws of the Home for the Friendless…. Notes: Friendless and destitute children, either orphans or uncared for by their parents, shall be received into the “Home,” for daily care and instruction, comfortably clothed and provided with dinner — children shall also be received as inmates of the “Home,” until permanent homes in Christian families can be secured for them by adoption or otherwise — as soon as admitted their cases shall be laid before the Board of Managers, who shall decided upon their retention or exclusion. Notes: The children shall be instructed in the rudiments of an English education; they shall be taught needlework, general housework and cooking. At the age of sixteen, or after having served three years in the Institution, they shall be entitled to a certificate of character and acquirements. Notes: Parents or guardians may place children in the institution, either to remain there until they are eighteen, or to be provided with a suitable and Christian home, at the discretion of the Mangers, who shall be responsible for their welfare and happiness until the age stated above. In either case, the parents or friends shall sign a written agreement, not to interfere with or trouble the Managers or the family with whom they may be placed, nor claim the child until she arrives at the age of eighteen. This rule shall not be departed from, except in cases of extreme destitution, when temporary relief may be afforded. Notes: The Matron, being the head of the house, shall see that such children as are permanent inmates of the “Home,” be kept neat and tidy in their personal appearance, that they retire and rise, and have their meals at a specified hour, that they are industrious during working hours, and impress upon them the necessity of listening attentively to the tuition and advice that may be given to them. She shall also require from all the children unquestioning obedience, and see that the order and decorum of a well regulated Christian family be strictly observed. Notes: A stated correspondence shall be held with all persons to whom the children may be given or apprenticed. The Managers of the Institution shall act as the guardians of such children as may be committed to their care, not only while under their direct supervision, but also in case of the death of foster parents, or the unfaithfulness of those who may have them in charge. Notes: Home of Friendless opened Apr.2. Notes: The Child’s Hospital, so long a hope deferred, has resulted in efficient organization; thus opening out another avenue of benevolence from the Institution. Like all similar enterprises it must be at first of slow growth; bit it has already received the blessing of suffering childhood, whose homes of poverty could not afford them sunshine or pure air, far less medical skill and nursing. See: Eighteenth Annual Report of the Home of the Friendless, 1872. Notes: We would here make our acknowledgments to uor able corps of consulting and attending physicians for their faithful and tender ministrations to the children of the Insitution and the Hospital. In a household of 140 children, of whome 85 are under 9 years of age, our bill of mortality is so light, as to give assurance — in addition to the faithfulness of our physicians and nurses — of an unseen ministry of Angels. 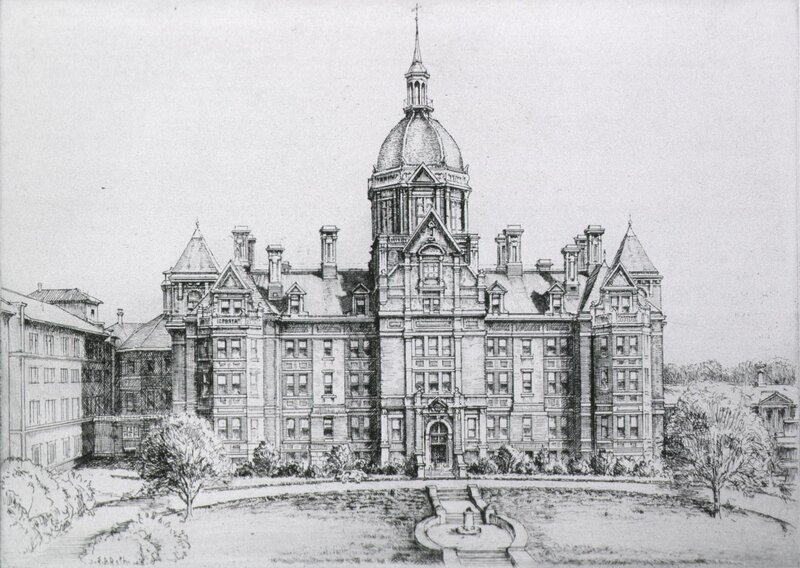 Notes: The Hospital Wards are cheerful and well ventilated; comfortably furnished and provided with skillful nurses. Children between the ages of two and twelve years are received and nursed free of charge, or at such rates as may agree with the circumstances of their guardians. 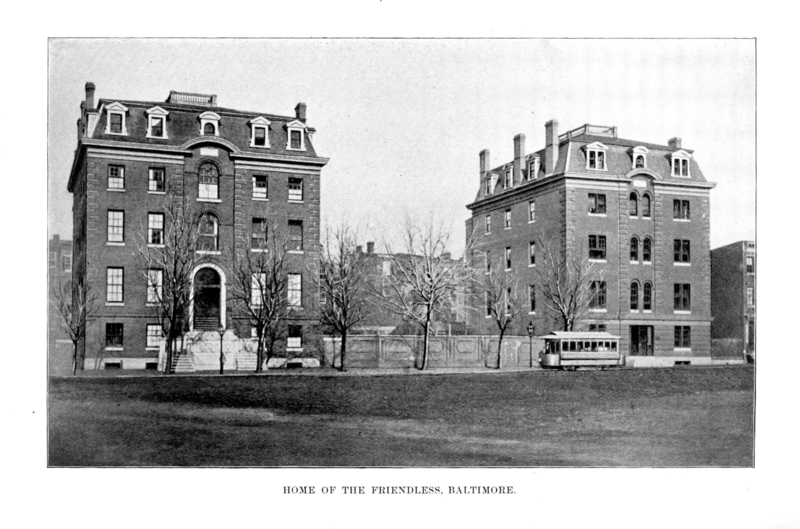 Notes: THE HOME OF THE FRIENDLESS, is situated at the corner of Lafayette and Druid Hill avenues, Baltimore. It is a large brick building, which was erected at a cost of $62,000. It was organized in 1854.The chief aim of the founders of this institution was to respond to a need for providing a home for the friendless and homeless children, orphans, and half-orphans, or the offspring of vagrants. It has been managed since its organization by a board of ladies, who, by close attention and efficient management, have made the institution one of the most prominent charitable institutions in the State. From its opening to the present time there have been received 5,000 children, and homes have been secured for nearly one thousand of this number. The institution has a capacity of about 200 inmates. The present number of beneficiaries is 165. A kindergarten and other educational facilities are successfully conducted. The home knows no demonimational creed, being non-sectarian. Its principal source of revenue is derived from private contributions. For many years the State has appropriated different sums towards it maintenance, and the General Assembly of 1892 contributed the sum of $3,000 per annum.